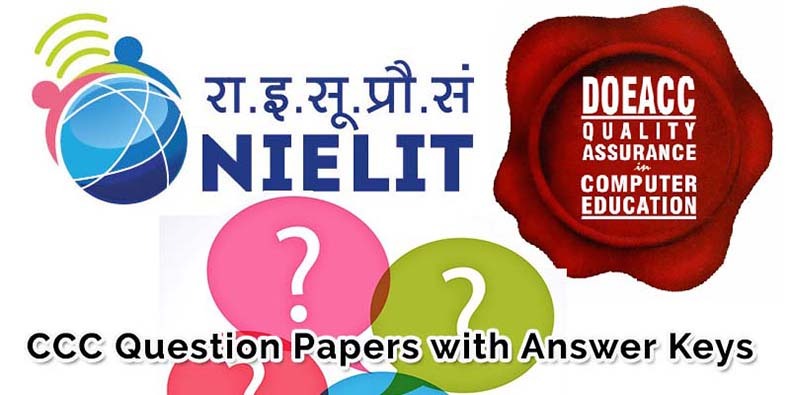 After so much appreciation for CCC Sample Question Paper with Answers SET-A, its now time for another CCC Question Answers Sample Paper for all the candidates preparing for the upcoming DOEACC / NIELIT CCC Examination. Once you go thru with all the previous year CCC exam question answers, you will get a clear idea about questions asked in the CCC Exam. On the other hand, it will boost your knowledge base and help you crack CCC Exam easily. In last, best of luck for your CCC Examinations, don’t forget to check latest CCC Exam Syllabus. 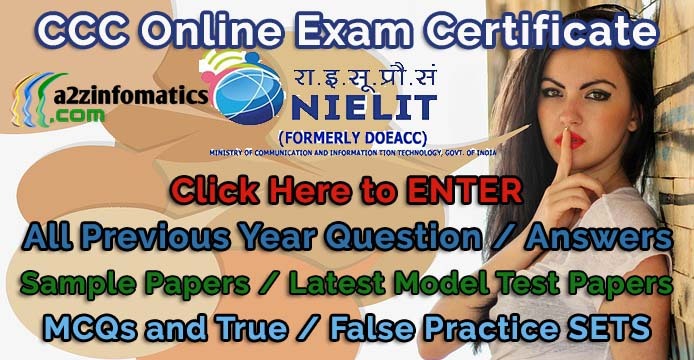 DOEACC / NIELIT CCC Model / Sample Question Paper with Answers – Previous Year CCC MCQ’s SET B. Note: This CCC Sample Question Paper (SET-B) consist of total 50 question with the answers at page no 4 of this post. (a) left on the page. (b) centre of the page. (c) top of the page. (d) bottom of the page. (a) use relative position when copying formulas. (b) use absolute position when copying formulas. (c) use mixed position when copying formulas. Ques 8- What do you need to put your web pages on the www ? (a) A connection to Internet. Ques 9- Which was the first company to launch mobile phone services in India ? Ques 10- What is a BLOG ? (c) A personal or corporate website in the form of an online journal. (d) a personal or corporate Google Search. Ques 11- Which is not online Indian Matrimonial Website ? Ques 13- Which of the following is not related to information security on the Internet ? Ques 14- Which is the largest unit of storage among the following ? Ques 15- Which number system is usually followed in a typical 32 bit computer ? Ques 16- Which one of the following is an example of Operating System ? You are now on the Page No 1 of this Post. Complete Answer Keys for CCC Previous Year Question Paper Set-B on Page no 4 of this Post.